PowerShell replaces cobbled-together assemblies of third-party management tools with an elegant programming language and a powerful scripting shell for the Windows environment. In the tradition of Manning's ground breaking "In Action" series, this book comes from right from the source. Written by Bruce Payette, one of principal creators of PowerShell, Windows PowerShell in Action shows you how to build scripts and utilities to automate system tasks or create powerful system management tools to handle the day-to-day tasks that drive a Windows administrator's life. Because it's based on the .NET platform, PowerShell is also a powerful tool for developers and power users. This book is designed for anyone who wants to learn PowerShell and use it well. Rather than simply being a book of recipes to read and apply, this book gives you the deep knowledge about how PowerShell works and how to apply it. Part I - Learning PowerShell This comprehensive tour of the PowerShell language and runtime introduces the language and offers a deep insight into how and why things are the way they are. Part I, covers the PowerShell language including the syntax, the type system with examples showing how each feature works. Chapter 1-PowerShell history and a quick tour of the features of the environment. Chapter 2-PowerShell concepts you'll need to put PowerShell to work. Chapter 3-The PowerShell type system and its relationship to .NET. Chapter 4-Operators and expressions including basic arithmetic, comparison and assignment, wildcard and regular expression pattern matching. Chapter 5-Operations for working with arrays (indexing, slicing) and objects (properties and methods, output redirection, the formatting operator and PowerShell variables. Chapter 6-PowerShell language constructs like if statement and loops. Chapter 7-Programming in PowerShell, including functions and scripts and variable scoping. Chapter 8-Object construction and extensions, Scriptblocks and how to extend the PowerShell language. Chapter 9-Error handling and debugging. Part II looks at applying PowerShell in specific technology areas and problem domains. Chapter 10-Text processing such as basic string processing, file processing (including handling binary files) and working with XML documents. Chapter 11-Locating, exploring and instantiating types in the .NET framework including generic types with applications including network programming and WinForms. Chapter 12-Using the application automation models to script Microsoft Word, WMI from the command line and in scripts to inspect, update and manage a Windows system, and VBScript interaction. Wow, I wrote a book. One moment you're a humble programming language designer and the next you're up until 2:00AM every night trying to figure out how to say "and in the next example" 500 times without being boring. So why write it? Mostly because of PowerShell. Although PowerShell draws heavily from existing technologies, it combines them in some very novel ways. This kind of novelty leads to misunderstandings. As we showed our work to the world I found that there were a number of questions that were being asked over and over again. These questions would usually arise as a result of some prior language experience that the user had. There needed to be a way to gather this information altogether in one place. It's astonishing was how much power comes out of the synergy of the various technologies underlying PowerShell. The PowerShell team would read people's blogs and be astonished by the creativity that was being demonstrated. This book tries to foster that creativity by conveying just how capable the PowerShell is. And finally, this is the book I wanted to read. I love programming languages and the best books are the ones that explain not only "what" but also "why". These books give the reader something more that just technical detail. They convey a sense of the overall design and some element of the intent of the designer. Learn PowerShell, be creative and above all, have fun. I have been searching for good reference material for PowerShell because I use it so much withy job. I received this book yesterday and I have already found answers to questions I haven't been been able to find clear answers for and learned new techniques...All in less than 24 hours! I only started using PS within the past year because of employer paid certification. It has made my job easier and much more interesting. This book is like taking what I have done and put it on steroids. The only ding that I have is it took a little too long for something purchased through Amazon to get to me. Consider this book the Definitive Reference for PowerShell. Written by one of the designers of the PowerShell environment, the author knows all the ins and outs, back-alleys, hidden rooms, and secret handshakes the language offers - and isn't afraid to grab you by the hand and drag you along (like it or not!) for the tour of your life. Therein, however, is the reason I can't recommend this as your first PowerShell book. The book is very logically planned out, the information very well presented in relatively easy to understand language, there is an abundance of script snippets to demonstrate what is being talked about, and the writing style itself is entertaining to read. But the author knows too much on the subject, and like any proud parent, often "too much information" is given, delving too deep into the gears and cogs of PowerShell and the underlying .NET framework for the (often basic) building block component, which might overwhelm the new PowerShell user, especially if the user does not have programming, let alone scripting, experience. So although I say don't make this your first purchase, make it your second - and probably your last. Start with an "Introduction" style book (like Microsoft Windows Powershell Programming for the Absolute Beginner) to get used to the complex environment (even if you've only had VBS/JS experience), get comfortable with the basics of the shell, then move up to this title. You'll soon find out that every aspect you thought you knew has much more to the story than you thought, and you'll walk away from this read able to do just about everything you want. 5.0 out of 5 starsExcellent book that explains the why of certain powershell features, beyond the how. Windows PowerShell in Action is one of the best books ever on PowerShell. I've been writing in PowerShell for a couple of years, but I still find myself going to the internet for how to do certain things in the language. I would found a way that works, but sometimes I just wasn't sure why it worked that way. This book has already answered lots of those I-wonder-why questions. When you know why certain features work the way they do, and examples of why they don't work the way you might have thought, that's when you know the language better and better. Plus, you have a better shot at figuring out your next question on your own, without turning to the internet. I bought this book back in 2007, as I was curious about powershell - which was version 1 at the time and this book was a key book to understanding it. I got a few books on powershell, and the style of this book at first seemed very choppy, but as I learned more about the language it became more understandable the way things were done in this book. The author has so much information about the way that the language was developed that it made certain things distracting. I have seen the author on the MSDN Channel 9 video's and that also probably helped me understand how the author voices things in a certain way. The book is very useful, and the most dogeared of my powershell books. There are better style books out there (for version 1). Now with Powershell 2.0 there will be a new batch of books, and I understand that the author is working on a 2nd edition for Powershell 2.0. There is a lot to powershell, and it presents a learning curve, but you will find that the time invested will bring a payoff. It feels like a swiss army knife for admins and developers. This book may give nuances to the language you might not find in other books. So I definitely would recommend this book, more so if it is a 2nd edition - for Powershell 2.0. 5.0 out of 5 starsOverly pleased with the book!!!! I am overly pleased! This book covered many areas that I couldn't find easily. I have bought other PowerShell books, but they were lacking on much of thr info I needed. I would recomend having this book once you are ready to take PS to the next level. 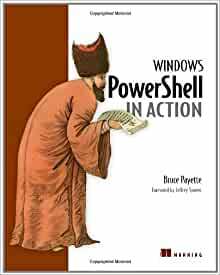 I have just started reading this book after a brief overview of its pages and appendixes and one thing is clear: PowerShell adds to Windows the dynamic and dimension that until now had been missing. With PoweShell Windows has brought all of its potential to the forefront. It is an exciting new development for programmers, administrators, and even every day power users of Microsoft Windows and thus far, this book offers a clear and in depth introduction to unlock the Power and Usability of Windows that was previously only available to only the most dedicated and committed experts in the most arcane ways, if at all. I highly recommend this book as a MUST MUST READ for anyone serious about getting the most out of their Windows Experience! 5.0 out of 5 starsThe definitive Powershell book. Look no further.. This is the only Powershell book you will ever need - until 2.0 comes out anyhow. Even then, this book builds the groundwork for using Powershell to automate all types of tasks and will be usable far into the future. I've used it to write a couple of Powershell applications so far and it's been worth every penny I paid already. After years of scripting in Windows shell, Perl, and some brief work with VBScript, Powershell is the way to go and this is the guide you need for it.